vs using a local home care agency for unneeded 24 hr care. non- medical custodial care at home? Home care agencies have stopped providing live-in care services in California due to some scary changes to labor laws in the last few years. In laymans terms, the CA courts ruled that if an employee was required to be somewhere, or required to be on call, then even though they were sleeping, they would need to be paid for that time. CA is the only state in the nation with this ruling and it overrides the Federal rules on domestic live-ins which say that they dont need to be paid for their sleep shift. So what happened is home care agencies choose to pay multiple caregivers, each working 8-12 hour shifts for the full 24 hrs EVEN when the coverage was not needed, instead of the normal 16 hour live-ins work. Add to that CA has become one of the highest min wage states in the country, and its "Domestic Workers Bill of Rights" and what you wind up with is the perfect storm. High min wages + 30% more paid hours each day + unique domestic worker OT laws = The most expensive state in the nation to grow old in... or atleast age in place at home. 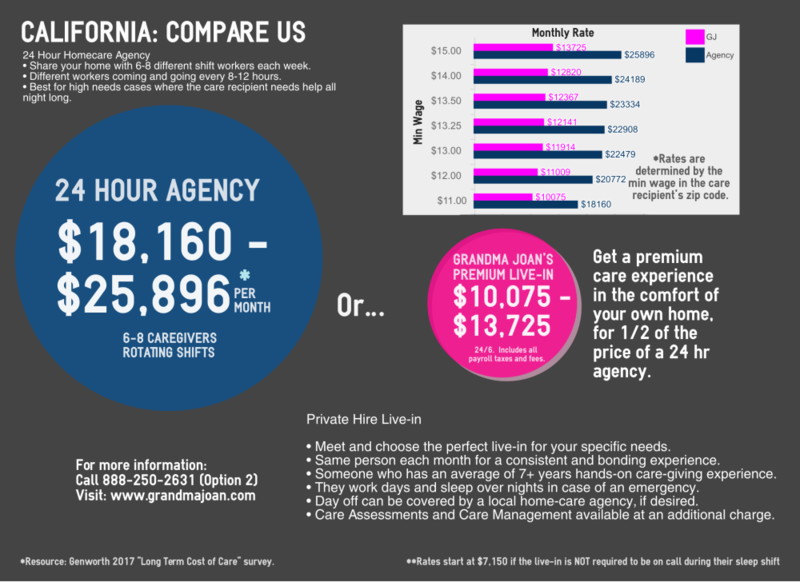 Instead of $250 a day, the same coverage in CA now costs $600 a day when going through a home care agency. Grandma Joan's may be able to help though. If you require the live-in to be in the home and or on call during their sleepshift, then you must pay them for that time. Paying them privately at minimun wage, a 24/6 day live-in will cost you $10,075 a month, based on the states min wage. That includes all of your payroll taxes, workers comp insurance, and even the payroll service. Thats a lot of money, but still more then 8k less than an agency. If your situation allows for the caregiver to be truly off during the night , then we why pay for 24 hrs when you only really need 16 hrs? If thats the case, then a 16 hr caregiver in most areas of CA will cost you $275 per day. Some exceptions apply. That rate includes all required CA payroll taxes, and our partner payroll service to handle all your payroll obligations for you. You can also get CA Workers comp insurance for under $500 a year for 100% liability protection and total peace of mind. For the second scenario, it is suggested that CA families should set forth specific policies in the employee contract that confirms the caregiver is not on call, has no duties after their shift ends, and has the freedom to come and go as they please during any unpaid hours. Call us at 888-250-2631 between 6am-4pm PST for more details. The wellbeing of your loved one is your main concern, which is why you would like to ensure that they benefit from the best possible options. At the same time, the costs involved should be more than affordable so that you are certain that your relative will be able to get the care they need without you worrying about going over your budget. Fortunately, our Live-in care agency CA can offer you just that, the opportunity to make the smartest decision for your parent, while being able to provide them the most important advantages that the right professional is able to offer. The main difference between a live-in care specialist and swapping them every 8 hours is the cost that you would have to put up with. Generally speaking, a live-in caregiver through our model will cost you about half the cost of using a home care agency to provide you with 24 hr coverage. As long as you can provide the live-in the 8 hours they need to get their much needed rest, they can work for 16 hours and take excellent care of your loved one. This is only one person that they would need to get used to rather than having to meet three to six caregivers in a week. We are talking about offering you the option of investing in the services of a specialist with more than 7 years of experience. One of the main concerns that you might have been dealing with for some time now is the fact that your mother or any other elderly relative has gotten to a point where they are unable to care for themselves on their own. Some prefer to step in and try to help them anyway they can. But, when it comes to the point where you need to give them their medication, help them bathe, get dressed, eat and so on, you will need to consider hiring specialized help. No matter how you look at it, the assistance of a Live-in care agency CA comes in handy, especially if you have been looking for caregivers for a while now and are feeling overwhelmed by the whole process. The problem with not knowing how you are going to find your parent the next time you visit them is that you will be incredibly stressed at all times. This whole situation can be easily solved as long as you rely on our team to help you find the best live-in caregiver. When talking about the options that you currently have, here are the two main ones: the first involves hiring different caregivers that take 8 hour shifts and come and go day and night; the second requires you to provide a room where a professional live-in will stay while taking care of your loved one. Both solutions sound good right now, but when we go into detail, you will realize that live-in caregivers are much better than the caregivers that cannot wait for their shift to be over. In the first scenario, these individuals may only make your mother or father feel more nervous, because they are always coming and going. As you may know, they need stability and someone that they can talk to, that they feel they can trust and that they will get used to. This will not happen when you hire 3-6 people that work in shifts. You can expect our Live-in care agency CA to explain everything to you even further when we meet for the first time. We will talk about your particular situation and the needs of your family member so that at the end of the day you can relax knowing that they are in good hands. One of the main reasons why you should be looking into live-in caregivers would be the fact that when it comes to monthly costs, this option is much more affordable than the one where you have to pay three to six different caregivers. There will be days when one of them will not be able to make it and the agency that they work for will send over someone new, fact which will prove to be even more stressful for your loved one. There is a way you can avoid all of this and actually make the best choice in this situation. Rely on our Live-in care agency in MA and let us help you find the most suitable professional that can turn into more than just the person that cares for your family member, into a companion that is there for him/her day and night. We are talking about an experienced individual that will work two 8 hour shifts back to back and then get 8 hours of rest. When their shift is over, they will still be there to provide any help required in case of an emergency. After all, you never know what might happen and it is reassuring to know that your loved one is not alone in the house at night. If you are wondering what kind of services live-ins are able to provide, the answer is pretty simple – you can consider them a family member, because this is how they will act when it comes to cooking, cleaning, walking the dog, taking your parent to any doctor appointments, offer help with toileting and handle many other tasks. You can be rest assured that hiring a caregiver that has years of experience in caring for others is one of the wisest decisions you could make. This is a great alternative to moving your mother or father into a retirement home. When talking about private home care, it is imperative that you opt for the assistance of an agency that can help you find the best live-in caregiver. There is no other channel safer than a team of professionals that match families with the right live-in specialists. We have been doing this for a long time now and can help you as well. Right now, it might seem like something you will need to be worried about in the future. But how near is that future? Think about how often you manage to visit your parent, if they seem to have trouble dealing with daily activities or if they have started forgetting their medicine. If you have been thinking about this situation for a while now, it is time to act. Do not postpone this any longer as actually hiring someone to be there for your family member night and day is one of the smartest choices you could make. At any given time, you know for sure that there is a certified caregiver right next to your mother or father. They will be living in the same home. Even if you are unable to be there at all times, you know that they are taken care of by someone who will prove to be more than their caregiver, someone that will be their companion. It is in your power to do something about the difficulties that your loved one is handling on a daily basis. You just need to contact our Live-in care agency in MA and we will do the rest. Keep in mind the fact that we screen all of our caregivers and that there is an entire process we need to go through before actually matching your family with a proper live-in specialist. Make sure that you contact us today so that we can answer any additional questions you might have!